You know those blocks you use to test your pattern before you make dozens of them for the quilt? Before I made "All Grown Up" for Moda Bake Shop I pieced two blocks - obviously using scraps of different whites - to make sure all was well. Yesterday I saw the blocks and could not resist turning them into a tote. This one measures 13" x 17-1/2", is lined with matching gray fabric, and has batting in between (I ran out of Soft & Stable!). I followed my tutorial for the Blooming Bag, except for the handles. Here is the other side. I added the ric-rac for a pop of different color. It was stitched with Aurifil monofilament. 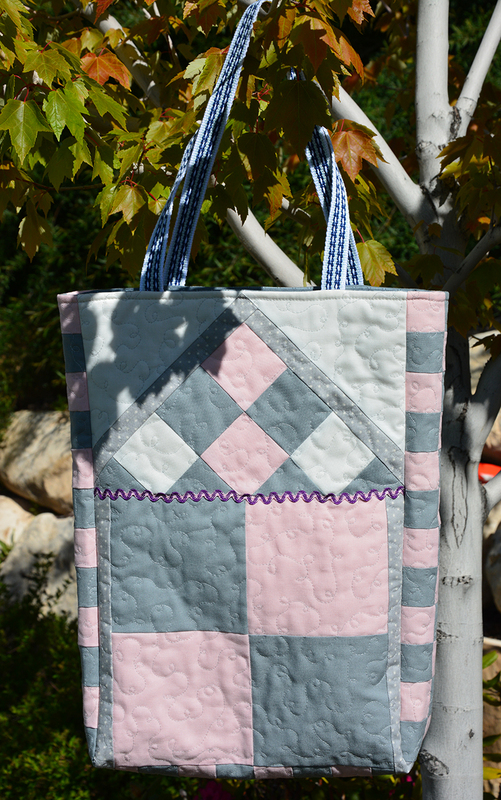 In fact, this tote was pieced and quilted using Aurifil 50 wt gray. 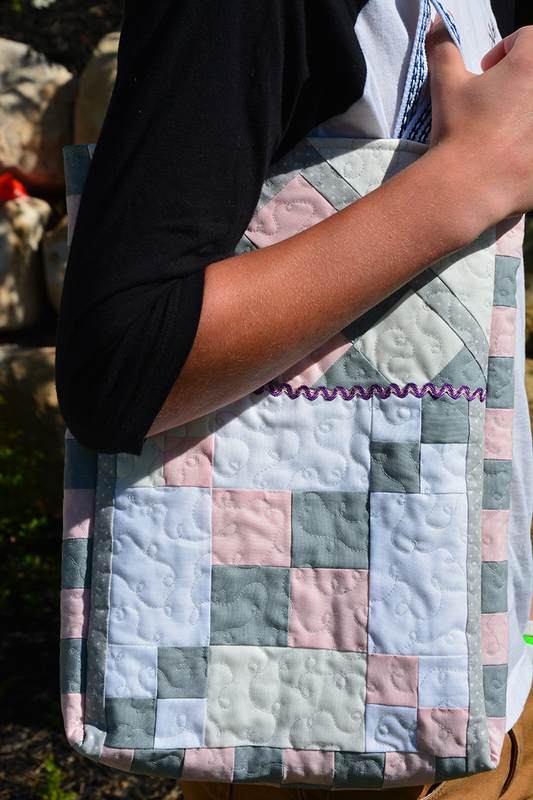 The bottom and sides are also made of leftover four patches with same fabrics. 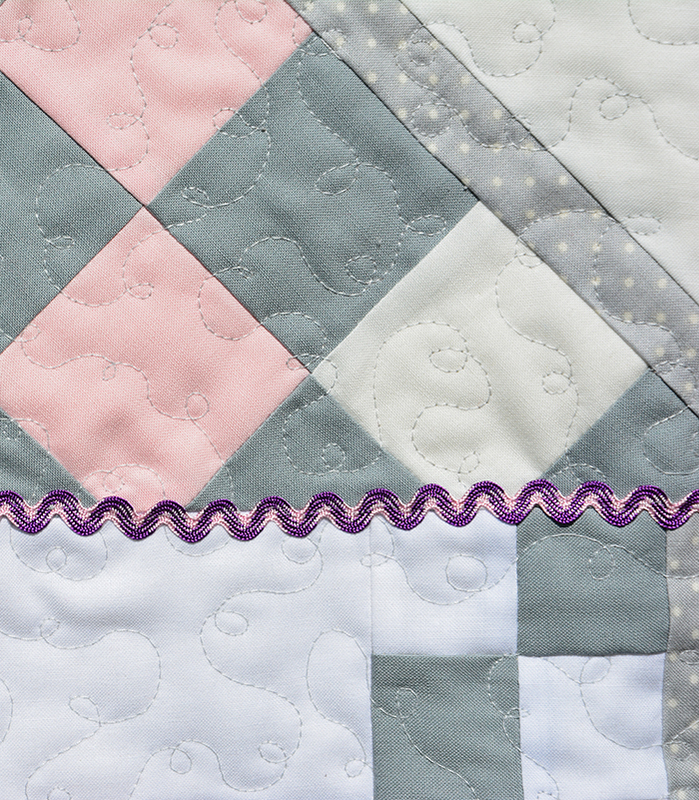 Simple quilted loops contrast with the straight lines of the blocks and go well with the ric-rac. These Moda Bella Solids, and the gray with white dots, make me happy! For handles, I used recycled belts as on my last few bags. They are sturdy, do not fray, and have fun colors and texture. So, don't discard the belts that come with your (or your kids') shorts and pants. Store them in your studio for future bags! 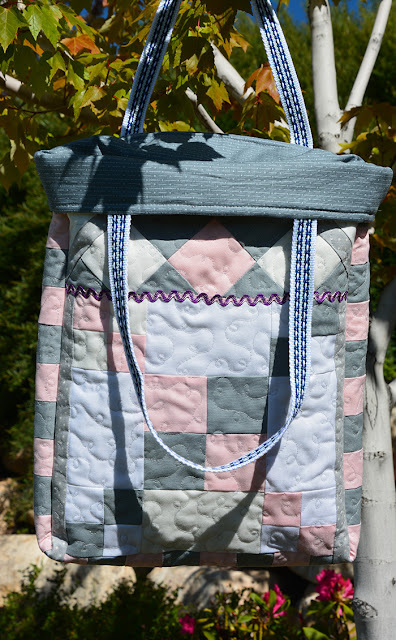 I will link this up to Freemotion by the River today, and Crazy Mom Quilts and Confessions of a Fabric Addict on Friday. Until then, have a fun week! Such a great idea.The tote is gorgeous. Looks really good. Great colours and the quilting is just lovely.